A playgroup or preschool visit with Penny Reeve is a fun filled morning of stories, craft and more. a supply of books for purchase (or order forms for pre-orders. Penny is more than happy to match her program to the current themes of your class or group if required (eg. animals, the body, etc). 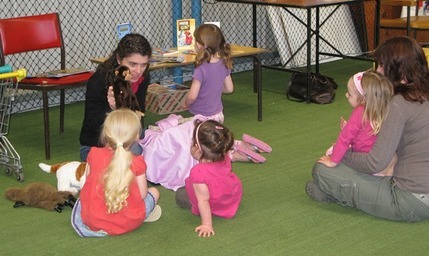 Penny can easily visit playgroups and preschools in the Sydney area. Penny takes bookings for playgroup or preschool visits most weeks during school term. Please contact her for availability. Generally playgroups are charged a ministry appropriate fee, plus travel costs. Preschools are charged according to time and preparation. In both circumstances Penny appreciates the opportunity to make her books available for purchase and can supply order forms ahead of time to help with this. Tamara Sharp, playgroup leader, Blue Mountains, NSW.